If you have been reading my UFC posts, you would notice a trend. There are very few fighters that I pay to watch, and even fewer that warrant my time to review. In only 4 professional fights, Brock Lesnar has become one of them. In what could be called the fastest ascension to a title fight in the history of any combat sport (boxing, MMA, or otherwise), Brock Lesnar was slated to take on Randy “The Natural” Couture, the forty-something wunderkind, in a battle for what amounts to the “Baddest S.O.B. on the Planet” title (aka UFC’s Heavyweight Championship). The buzz up to this fight did not disappoint and some crowned it as the most anticipated fight in UFC history. If it was, it met the expectations. While the bout itself was not the best fight I have ever watched, the combination of anticipation and adrenaline made up for what the bout lacked. Surprisingly to me, Brock did not look like he was in the best shape. I mean let’s not get crazy here, the dude is a freak, but he still did not look as lean as I have seen him before. Maybe he wanted to carry a few extra lbs. to combat the excellent wrestling skills of Couture, or maybe he just was not in prime condition. Either way, when he stepped into the ring, he looked like a different fighter than I said seen in his previous bouts. Leading up to the fight, there was no outright trash talk, each fighter had the utmost reverence for the other and nothing disparaging was said. Pretty tame for Brock’s standards considering how he dug a grave in the ring after beating his last opponent. Yet Brock appeared to me to be…dare I say it, hesitant? Once the bell rung he substituted his hard-charging bull-rush across the ring for a trot and fist bump to Couture. He seemed afraid early on to make any mistakes that would let Couture take advantage and end the fight early. In other words, I guess he was sizing him up. Interesting tactics for a beast of a man that usually requires getting sized up by other opponents. Nonetheless, Couture was just as hesitant, and while Brock clearly was not dominating Couture in the first round stand-up wrestling match, he was not losing either. I think Randy’s strength surprised Brock, but once he had it under control, he finally decided to let loose. That’s what happened in the second round when one of Brock’s mighty “hamhocks”, as Couture called Lesnar’s fists, hit him over the head and sent him tumbling. When that happened, we all knew it was only a matter of time as Brock sent Randy’ head bouncing off the mat repeatedly, that the bout would be stopped. Randy seemed gracious in defeat, and in a turn of usual antics, Brock was gracious in victory. Randy might have been a tad rusty after his Hollywood layoff, but don’t let that fool you….Brock beat the best that night and earned the belt. 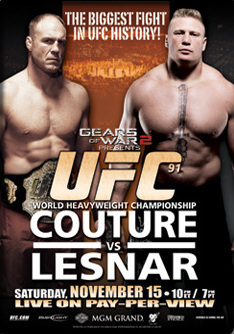 Brock Lesnar has officially crossed the lines of marketing tool, to legitimate fighter. I will continue to look forward to his fights and not until some new supernatural specimen with more hunger comes his way, he will hold that belt. Brock Lesnar is the antithesis of Kimbo Slice. His career was not carefully calculated, nor contrived. He may have been the product of “fake wrestling” but the opponents he beat in that ring were 10-times the athletes and fighters than the ones Slice beat in the tough streets of Miami ever were. Lesnar asked for the toughest matchups he would be permitted to take on and then went out and beat the toughest of them all. Here’s the reign of the Brock Lesnar era as Heavyweight Champion. As far as the UFC’s mainstream appeal goes, it may not get much better than this. Ok, I know I was supposedly talking too much during the fight, but I still think that randy looked good…until that hit when he went down and his head started bouncing off the mat repeatedly. And yes, brock had back fat!